Every time March rolls around the city of Austin feels electric, like an impending thunderstorm, when you can sense lighting on your skin even from miles away. Weeks before the festival the whole city starts to transform, and so begins the great migration of music lovers, tech nerds, and cinephiles to the music & media Mecca that is South By Southwest. 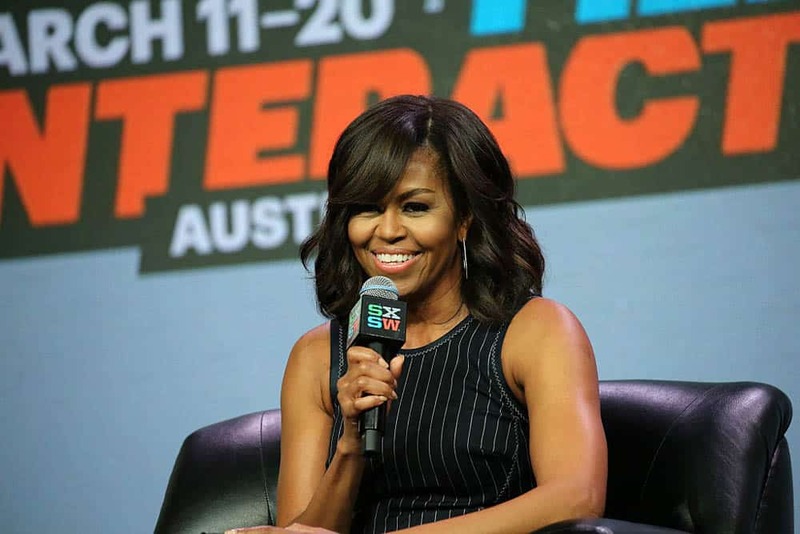 SXSW is the single most epic event of the year, bringing over 51,000 attendees barreling down on Texas’s relatively small capital, with more than 2,000 showcasing artists and 300+ panels, workshops and sessions across the entire city, in over 100 venues and stages. SXSW wasn’t recognized as an industry juggernaut at the start. This brand was brought to life with a vision of a handful of inspired Texans who loved music and community, with a desire to bring the world to Austin, and bring Austin to the world. The festival is now going on 31 years. It’s list of influential industry leaders who have spoken, international and local musicians who have performed, and once-in-a-lifetime events that have occurred over the last three decades is far too expansive to adequately convey in one blog. 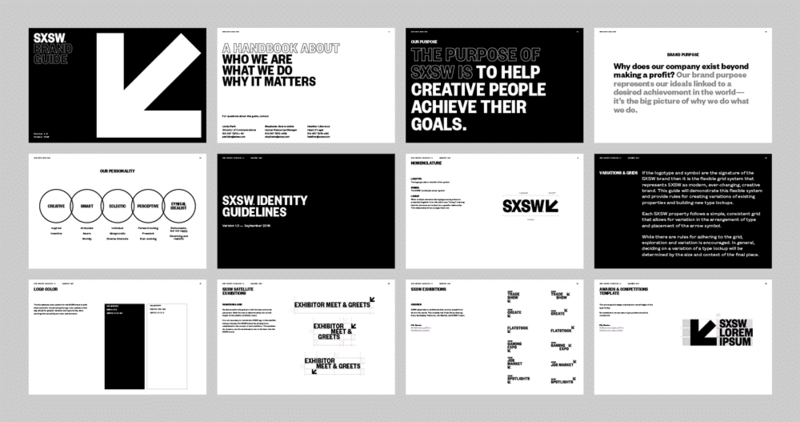 But these individual elements are all wrapped up in one thing – the SXSW brand itself. 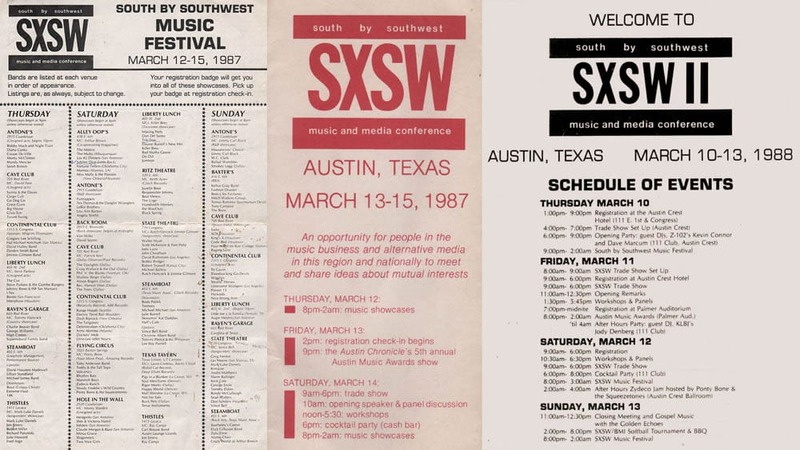 So, in order to understand the mission, growth and future of South By Southwest, let’s dive-in and take a look at how the brand has evolved over the last thirty years. 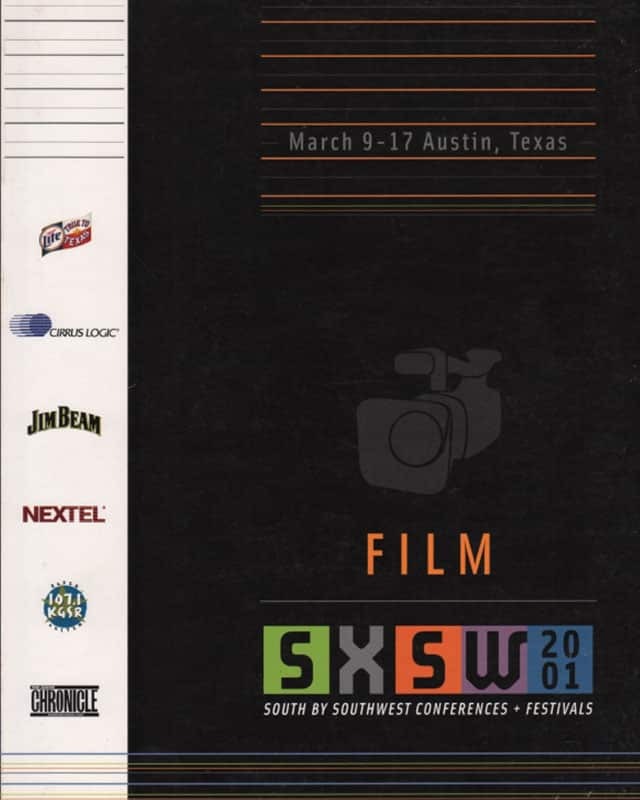 When observing the early SXSW branding, you wonder if the founders had any idea how big the festival would get. It all started in 1987, behind the closed doors of the Austin Chronicle, where like-minded creatives brainstormed what would become the most lucrative source of culture and economy for Austin, TX. During the first years, the branding was simple but direct. The main objective of the festival was music and entertainment, surrounded by an heir of intellectualism, bolstered by discourse about the future of media. They wanted to give the appearance of a symposium mixed with a rock concert. They chose the name “South By Southwest” so as not to be restrictive. The name literally is a wide, general direction. The festival was never meant to be just one thing, confined to one space or idea. It was everywhere and for everyone. The design was simple, with a straightforward font. All the collateral was designed to get people to their desired events and nothing more. The earliest logo was a basic arrow pointing down towards the Southwest direction. This clever and understated icon symbolized the founder’s intentions to be a leading entity in the industry, pointing out current culture and where it was leading. 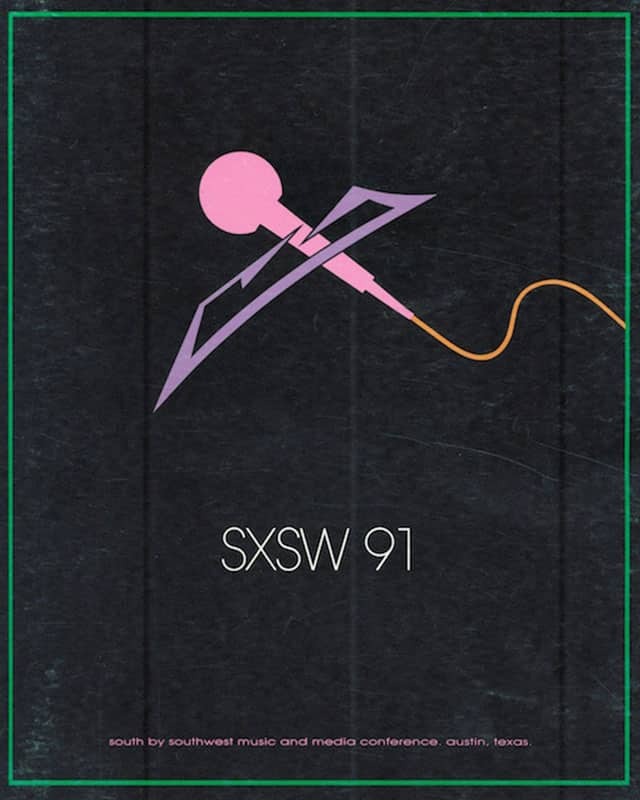 The arrow has been used throughout the entire lifespan of SXSW and is a familiar icon today. The simple branding allowed for Austin’s charm to shine and not distract from the diversity of the festival. This branding foundation helped SXSW grow into something totally unique and genuine, rather than being forced into some restrictive mold. 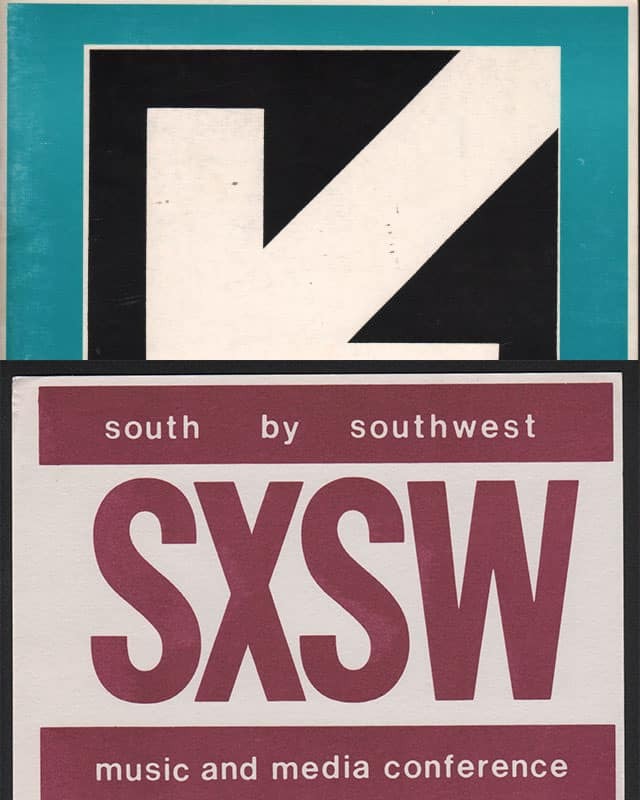 Though founded with the intention to focus on Music and Media, the first 7 years of SXSW primarily revolved around the music industry. And, by 1994 the festival had grown with steady success, with Johnny Cash headlining that year. 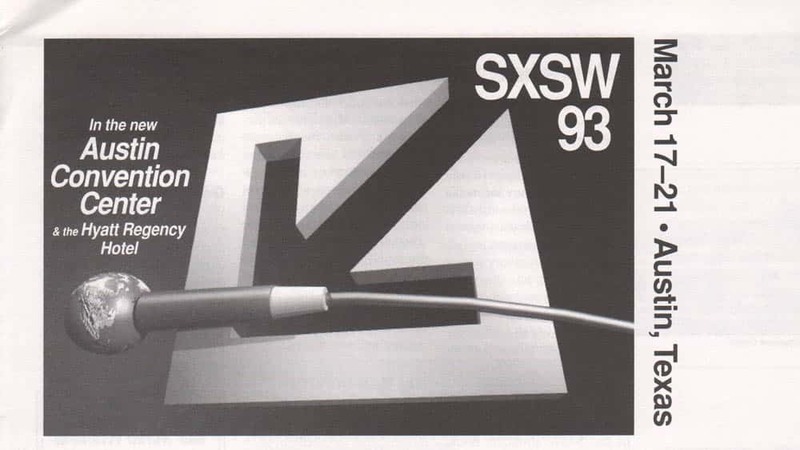 But, as was intended at its conception, SXSW was never meant to be about one idea or medium. 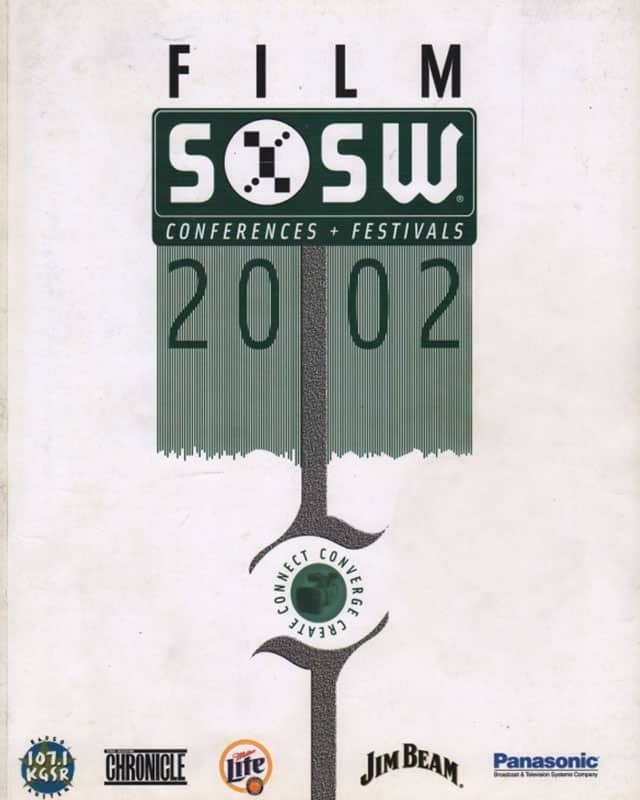 So, in 1994 the Film and Multimedia component was added to the festival. 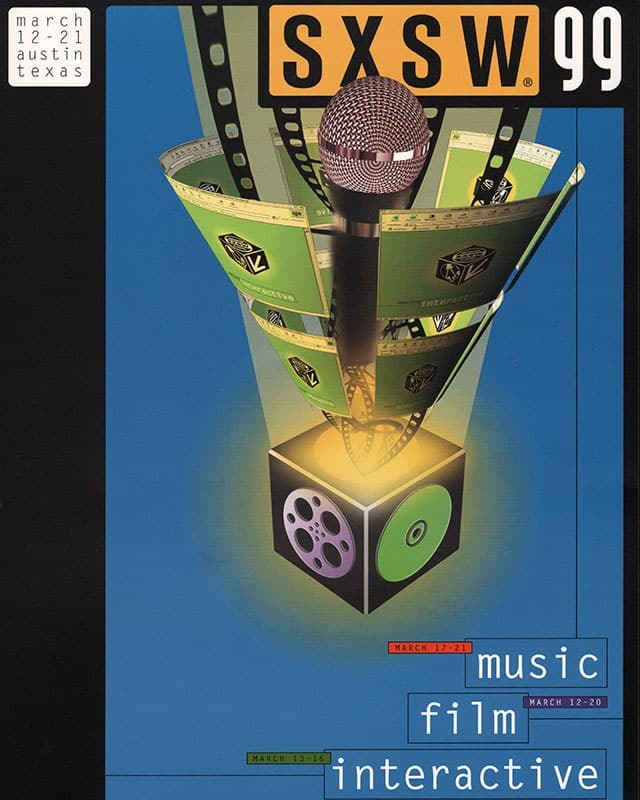 Echoing the format of the SXSW Music Event, the first Film Event offered panels, speakers and 2 world premieres, under the title of SXSW Film and Media Conference (SFMC). It was always intended that the festival constantly morph into something new, but the addition of two more separate aspects created new branding challenges. Anytime you add new elements to a brand, especially in the overall format and title, it can get confusing to the audience. 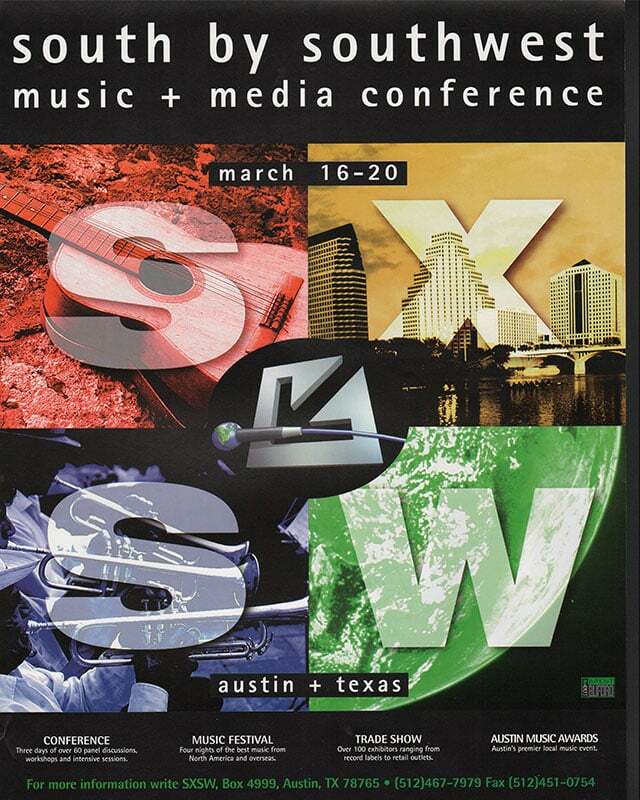 Perhaps that’s why in 1997, only 2 years later, the name changed from SXSW Music + Media Conference, to SXSW: Music, Film, Interactive. 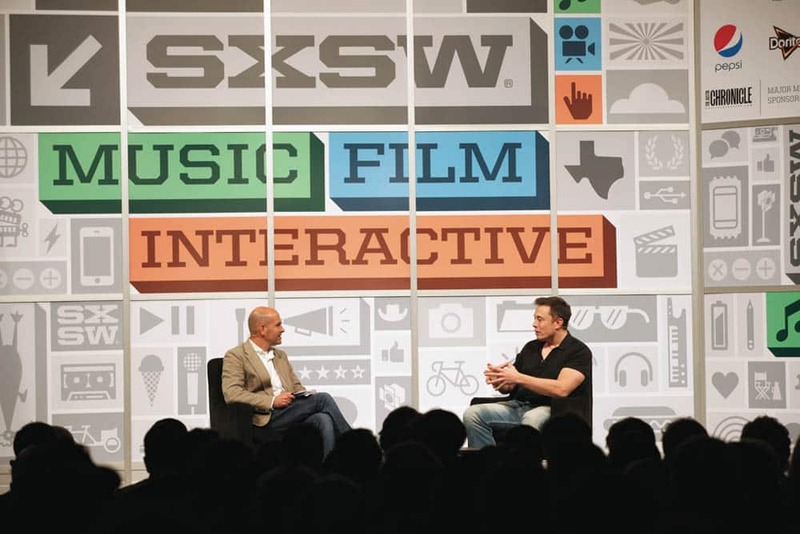 Whatever the reason, SXSW was marketing itself as a forward thinking, all-encompassing event. The graphics over the next decade were more random, featuring unique designs each year. The challenge was distinguishing between the 3 events. Most of the time the iconography was rather didactic, with a guitar representing music, a movie reel for film and CD-Rom for interactive. 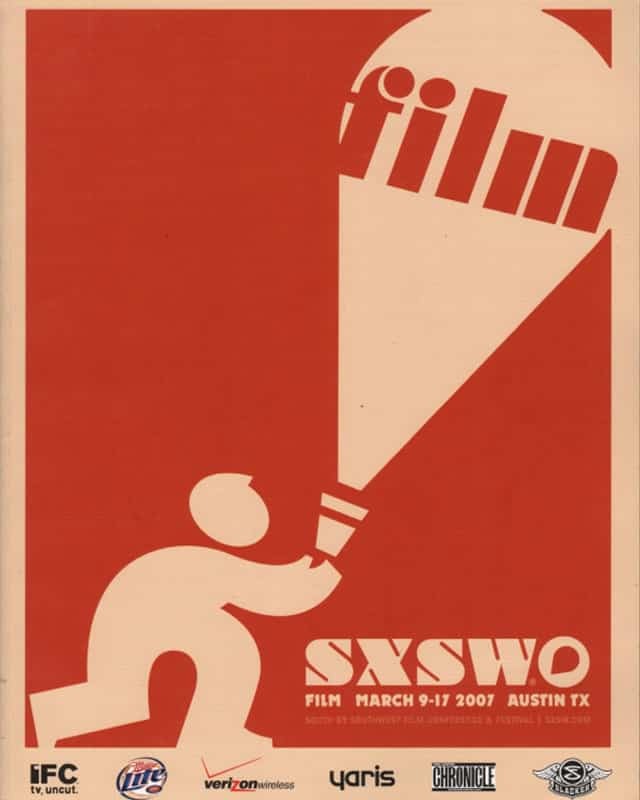 As the years progressed, the designs became more subtle with similar themes running across the entire SXSW gambit. The festival never ceased to grow. Interactive and Film came to be just as popular as the Music aspect, and every year the event took a new shape. 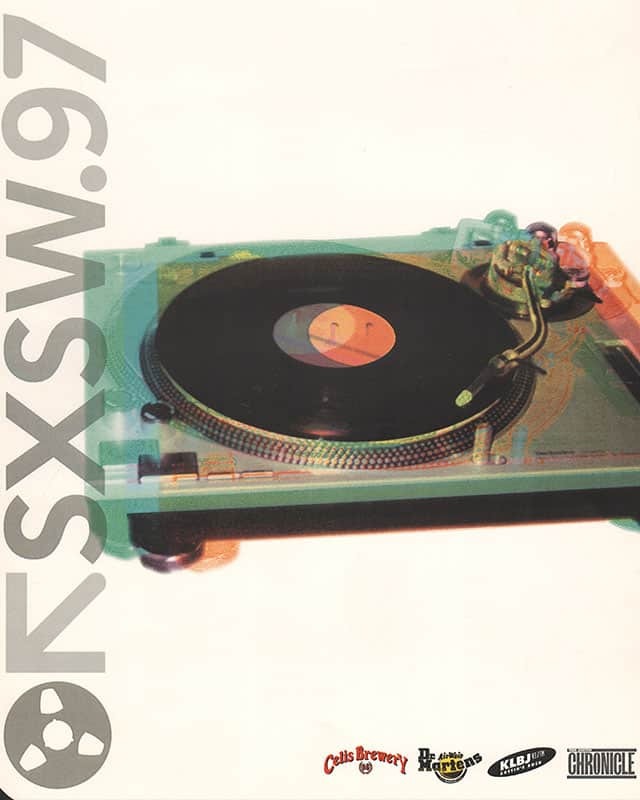 The early years of SXSW featured up-and-coming music acts, and speakers who were well versed in the industry, but lesser known. 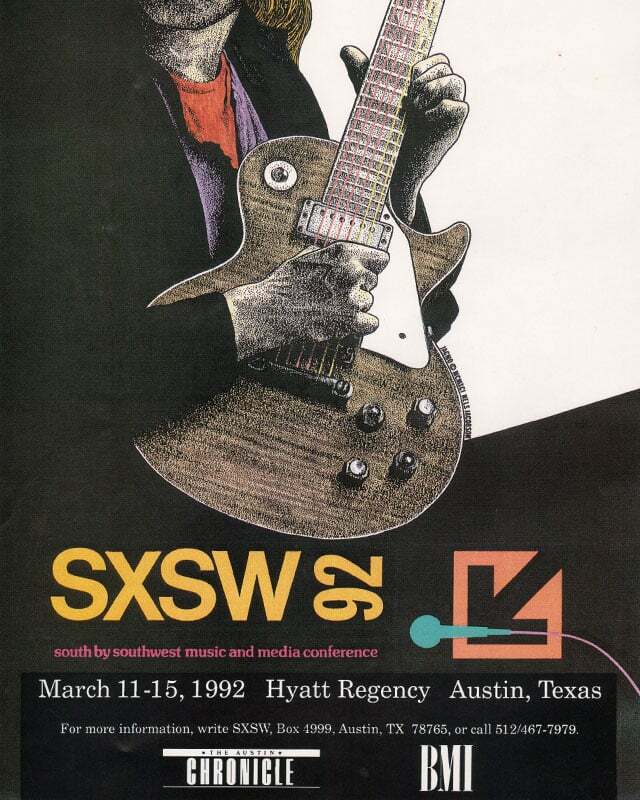 The first SXSW headliner was Reverend Horton Heat (Dallas TX), and the keynote speaker was Huey Meaux. In 2016, Barack and Michelle Obama both gave a keynote speeches. Film week has expanded to last both weeks of the festival, and primers the most notable films of the year. 2018 marks the 25th year of the Film Festival and includes 44 films from first-time filmmakers, 86 World Premieres, 11 North American Premieres, and 5 U.S. Premieres. That’s a whole lot of red carpet. Interactive now has its own full week of events with the most influential minds speaking round the clock at symposiums and conferences. The largest tech launches in history have gone down at SXSW, including Squarespace, AirBnB, and Uber. For the entire two weeks of SXSW, all around the city the world’s most recognizable brands set up pop-up venues, like the Spotify House and the Fader Fort. Energy drinks, every new kind of vape cigarette, startup apps and more have volunteers troll the streets with flyers, swag, and free samples. While HBO plasters the sides of buildings, billboards and even the pedicabs with advertisements (usually for the new season of Game of Thrones, but, alas, not this year). Brands will stop at nothing to grab the attention of the crowds at SXSW. 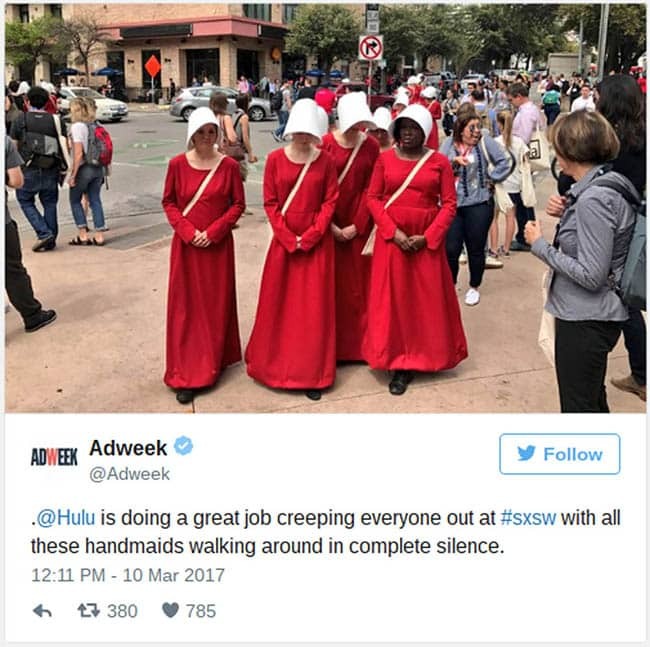 Last year Hulu even sent a large group of silent, choreographed Handmaidens from the Emmy Award winning series Handmaid’s Tale marching to the capitol building, in an immersive marketing stunt. With all that noise, SXSW branding needed to make sense of the chaos and act as a beacon for attendees to follow. For a few years they used 3 colors to signify each aspect of the festival. The iconography for each year was used on every form of print and digital medium, from 8 story banners to online schedules. It’s photographed behind celebrities on the red carpet, backdrops during keynote addresses and even spray painted on the sidewalks. SXSW is now collaborating with a design firm to create a basic standard to be used every year, at least for the next 7 years. This brand standard allows for full flexibility as the event expands. The basis for the branding is a return to simpler roots, focused around a basic san-serif font and the original Southwest-pointing arrow. It also unifies the three separate aspects and accentuates the original founders’ vision that SXSW is all-encompassing. It reiterates that fact that Music, Media and Film all go hand-in-hand.